Each winter, the Alderleaf Wilderness Certification Program travels to the north-central mountains of Washington state to practice winter survival skills. 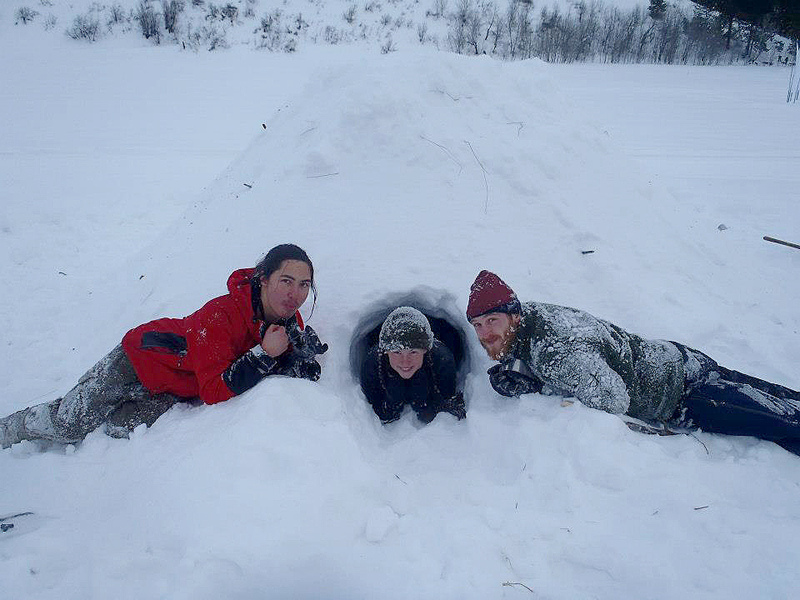 This trip includes building and sleeping in snow shelters, wintertime ethnobotany and wildlife tracking in the snow. The week started out with students participating in a snowshoe race. In this race, students strapped snowshoes they made out of willow branches on to their feet and challenged themselves and each other to see who could make it to the finish line with snowshoes intact. 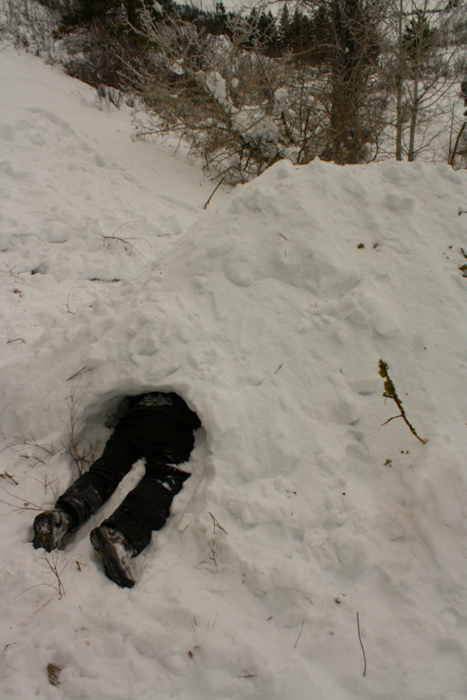 This type of shelter takes a great deal of work, but is also very warm and well-insulated when completed. Here are 3 students, Torin, Joanna and Rob showing off their completed quinzee. Here is another student, Kristian, demonstrating a trench shelter. 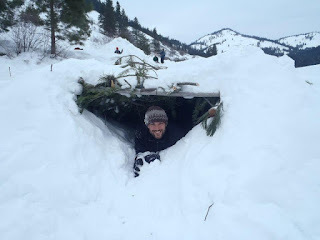 There are a variety of different trench-type shelters, and this one utilized pine boughs as part of the roof structure. On another day of class, a group of students hiked to the top of a ridge above the valley where the snow shelters were located. Here apprentice instructor Shaun, and student Elan take a moment to pause and take in the beauty of the snowy landscape that surrounds them. Snow provides a vast white canvas on which the tracks of many creatures are written. Getting familiar with the tracks and other sign in the winter landscapes is a source of enjoyment as well as a potential life-saving source of knowledge. Students learned to read the fascinating stories told by the tracks left by creatures such as long-tailed weasel, ruffed grouse, mule deer, red squirrel, and raven. 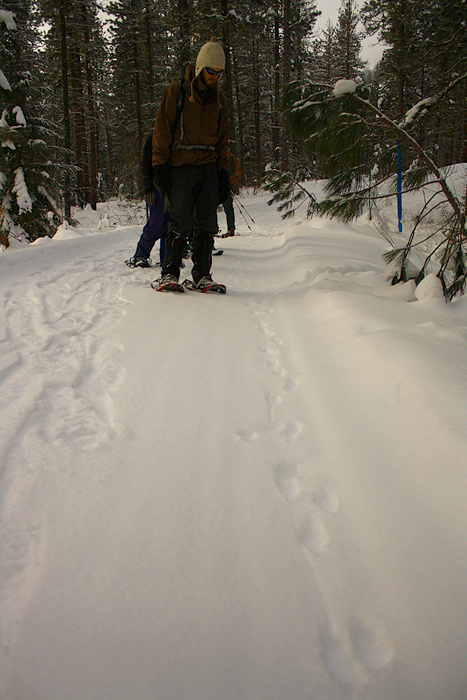 Here students follow the trails of 2 coyotes that wove their way through the snowy ponderosa pine forest. 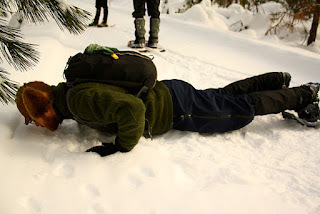 Here student Rob makes sure to utilize all of his 5 senses to engage with the scent mark of a coyote. Every species of canine has a distinct scent, that one can learn to recognize with practice. As we explored the forests, we occasionally came upon the old remains of kills sites from various predators. 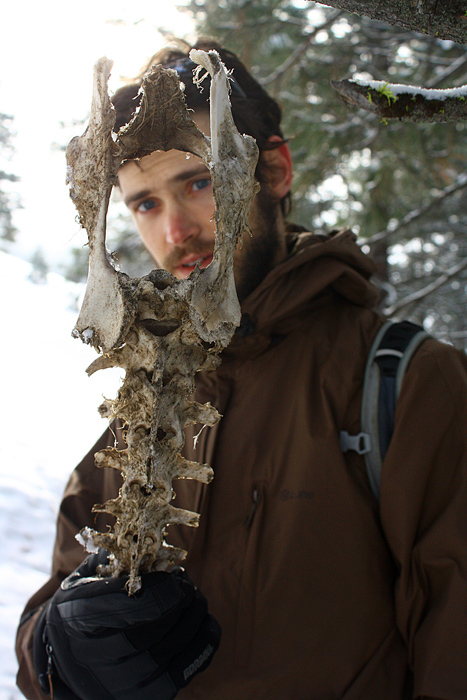 Here Ted takes a close look at the spine and hips of a mule deer. 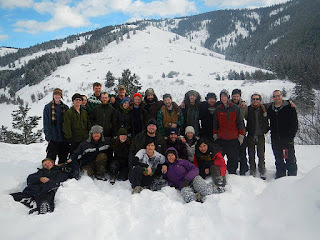 Another group of students went into the woods to learn about the use of different plants for wintertime survival. 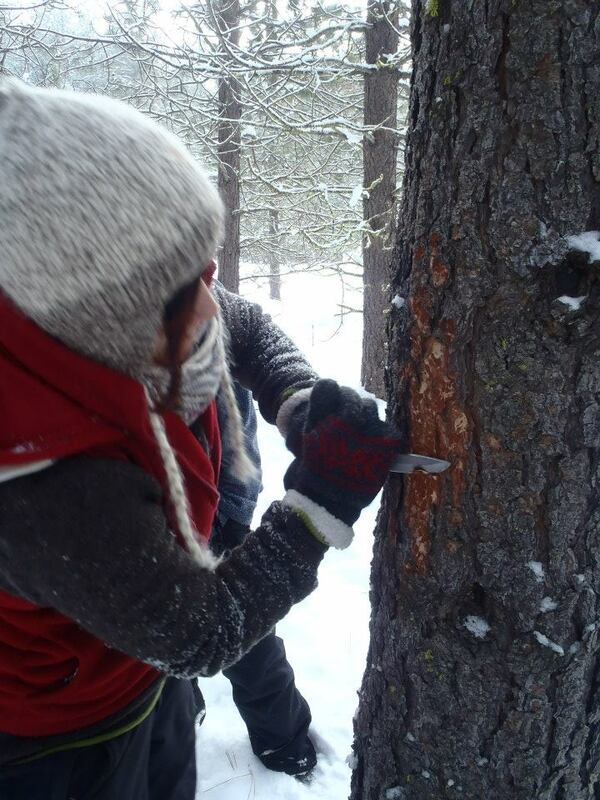 Here is Georgie showing them how to harvest cambium from a living Ponderosa pine tree. Here is a closer look at the cambium. 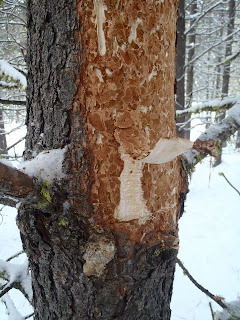 The cambium is the layer underneath the bark which transfers nutrients throughout the tree. This is edible on many kinds of trees, including all pines. The winter trip was a great success, and we are grateful for all of the fun, learning and sharing that happened for everyone in the class. Expect more updates from the Alderleaf Crew soon!